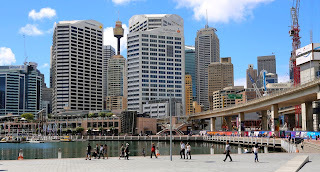 There was only one place for Australasian family history enthusiasts to be for four days from 9 March - the 15th Australasian Congress on Genealogy and Heraldry at the International Convention Centre, Darling Harbour. 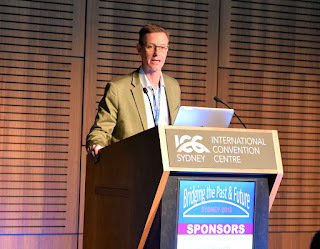 Congress was hosted by the Australian Society of Genealogists. As president of SAG, Martyn Killion, our family historian, was Congress convenor. I was one of the lucky 620 delegates to attend. Local and international speakers covered a huge variety of topics with four sessions running concurrently for most of the day! 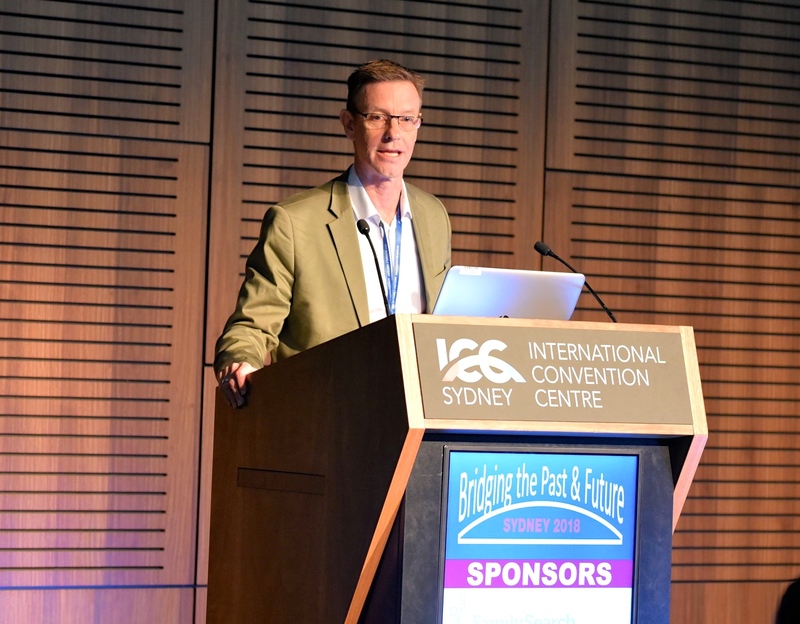 Often wanting to be in two or three sessions at once, I chose ones that aligned with my family history interests, using technology and genetic genealogy. So after four days of excellent speakers talking on interesting subject and with lots of laughs and fun along the way, I've pencilled the date in my diary for 2021! Martyn in one of his less formal moments! Congress theme was "Bridging the Past and Future". Early on Sunday morning as I looked out of the beautiful new venue towards the city and Clarence and Kent Streets, the Feeney's were there with me! Surely our 3rd great-grandmother was looking for a better life when she left Dublin in 1841 after the death of her husband. We know there were five children. Maybe there were more! Jane arrived in Sydney with her two older daughters, Eliza and Ann, leaving three younger children back in Dublin. They came to Australia under one of many assisted immigration schemes that operated in the 19th century. We're still not sure of the emigration arrangements that her sons, Edward and Thomas, arrived under in 1843. "Our Jane" was "selected" from the South Dublin Workhouse to come to Sydney in 1848 under an assisted immigration scheme known as "The Earl Grey Famine Orphan Scheme”. Jane and her four older children lived in Clarence and Kent Streets just a few minutes walk from the International Convention Centre. 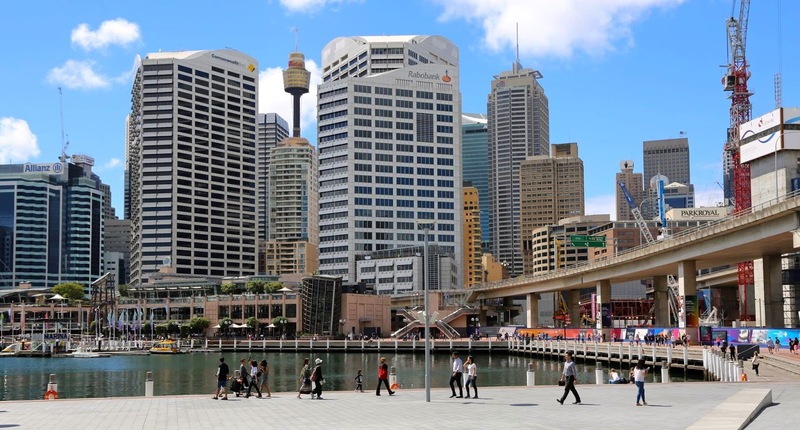 Imagine the excitement when the youngest of the five children, "our Jane", arrived in 1848 and was “housed” at Hyde Park Barracks just up the road from Centrepoint Tower. Mother and daughter were reunited after 7 years half way around the world and not having seen each other since "our Jane" was about 9. Within a few weeks, "our Jane" was assigned to work in Port Macquarie and taken away from her family again! It’s unlikely that she ever saw her mother or siblings again but there was communication. 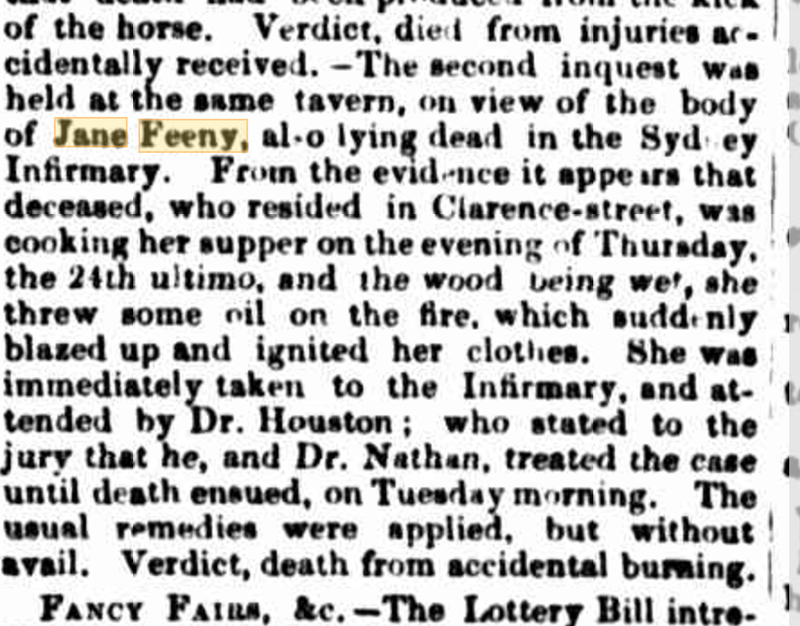 Ann Feeney died in Clarence Street in 1850 - probably at the home where she lived with her mother and siblings, Eliza, Edward and Thomas. She'd married Richard Wilkinson, a mariner, about 18 months earlier. 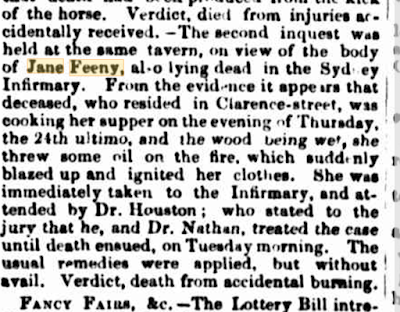 On 24 Jun 1852, our 3rd great-grandmother was severely burned at her home in Clarence Street while cooking supper. She died 12 days later in the Sydney Infirmary which was on the Macquarie Street site of Sydney Hospital. We’re not sure if Eliza, Edward and Thomas continued to lived in the same home after the death of their mother but they lived in the inner city. Eliza married in early 1854 and moved to Victoria with her husband, John Johnson. Eliza died in child birth on 31 December 1854 and their daughter, Eliza Rebecca, died 2 days later. Thomas and Edward continued to live in the inner city area for many years after the death of their mother and sisters while "our Jane" lived in Port Macquarie and then Kempsey. In the last six months, genetic genealogy has allowed us to bridge the years and reunite "our Jane" with her birth family and share the story with her descendants and those of Edward and Thomas. Genetic genealogy has another mystery to solve for us! Is Bernhardt Doppleganger, the Congress mascot, also a Feeney descendant? I've not been able to get a DNA sample to confirm my suspicions. My fear is that that he returned to Switzerland after Congress and we've lost a “Feeney cousin"! Martyn and Bernhardt on the same stage! Please feel free to contact us at chrisw9953@gmail.com about the Killion, Quinn and Seward Families. John and Jane are our 2x great-grandparents.